Lilies are always popping at Butternut Gardens. Can't wait 'til June when all the lilies start. 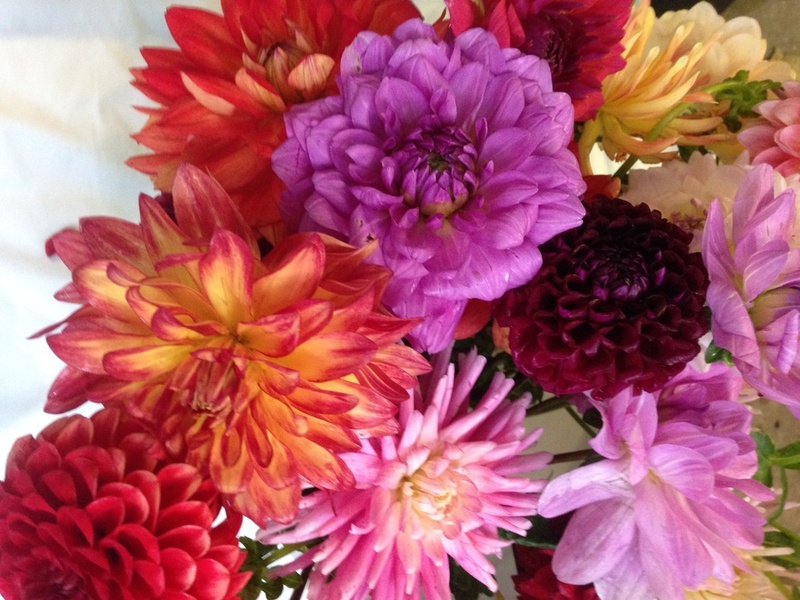 If you want to share in the beauty of flowers all season, why not choose one of my flower subscription services (limited to delivery in Southport, Fairfield, Westport, lower Weston). Then you could have flowers delivered right to your doorstep weekly, biweekly or monthly from Spring to Fall. Garden Phlox is not only gorgeous, but also offers one of the nicest, softest scents of summer. A bouquet of phlox will quickly infuse your home with floral fragrance, and you won't regret it for a second! With blooms ranging from lavender to white, light pink to very deep pink, salmon and several bi-color varieties as well, Phlox offers a rich variety of blooms for floral designs and gardens alike. Phlox are long-blooming and have been a garden favorite for over a hundred years. By growing a number of varieties, I am able to cut Phlox from mid- or late-June on and off through the Fall. The bright yellow yarrow in lower right puts real zip into any bouquet. Yellow and orange red hot pokers can be seen in the center of this grouping. In the previous Fleur du Jour I highlighted the bright and smashing red hot pokers, which actually come in many shades from red to orange to yellow as well as mixes of the above. Today I want to share a lovely pink and yellow combination from June, in which the yellow red hot poker and amazing yellow yarrow work beautifully with the season's pink dianthus, pink larkspur and pink Canterbury bells. Last year I cut 295 stems of the truly striking yellow yarrow known as Coronation Gold for early summer bouquets, and saved another 125 stems for fall cuts. By the time I take the fall cuts, the once bright yellow flower heads are a perfectly muted golden tone for the fall palette. With first cuts of Coronation gold yarrow made on June 10th last year, we have just over 120 days (and much snowmelt) to go to 2015 blooms. Let's keep the color coming as we dream of spring and summer flowers, and give the nod for today's Fleur du Jour to our wonderful Delphinium. From soft, light blue, to royal blue, to deep, rich dark-as-night blue our many colors of Delphinium add gorgeous color to complement or strike a contrasting note with other flowers. Let's not forget that we also have access to white and lavender Delphinium as well. Last year's first Delphinium cuts were taken on June 3rd and we had beautiful blue blooms the whole month through for a total of 354 stems. What's fun about Delphinium is that every year I always get some late summer and fall blooms to clip and add to our strong late season colors.